The American Repertory Theater at Harvard University (A.R.T.) and sound designer Jonathan Deans selected the Shure Axient Digital wireless microphone system and ADX series transmitters to provide clear and precise audio support for the world premiere of the rock musical, “Jagged Little Pill.” The high-energy musical is inspired by Alanis Morissette’s Grammy-winning 1995 album of the same name. The stage adaptation incorporates songs from Morrissette’s catalog, plus new material into an original and timely story. The production’s audio team sought Shure’s sound performance to ensure the audience would experience every lyric in a new element. Tasked with creating an audio experience that matched the quality of the Grammy-winning Album of the Year, the Axient Digital wireless system, Shure PSM 1000 Personal Monitor System, and Wireless Workbench 6 software worked to match the physicality required of the actors without sacrificing critical audio standards of quality, clarity, and tonality. Along with Axient Digital, the production team relied heavily on the ADX1M micro bodypack transmitter that features an internal antenna for enhanced concealment and comfortable wear. Wireless Workbench 6 also delivered added management and networking for the Axient Digital wireless devices to help control gain structure and frequency. Additionally, the company band also used more than one dozen Shure PSM 1000 in-ear monitors for audio monitoring. With the American Repertory Theater located in the heart of Cambridge, engineers also required a solution with an adequate wireless channel count that would accommodate a densely-populated area while still producing audio quality. The show explores a number of dramatic topics, depicted through taxing physical performances that require specialized equipment for the performers. “The internal transmitter antennas are a critical feature for a show like this, where the actors are performing intricate choreography and frequently changing costumes,” said Alison Schaefer, production audio technician at A.R.T. “It’s one less external point of failure we have to deal with, and we’ve had actors get so comfortable wearing the micro bodypack transmitter that at times they’ve forgotten that they’re still wearing it,” she said. The success of Axient Digital has inspired the A.R.T. to obtain additional channels for future shows. 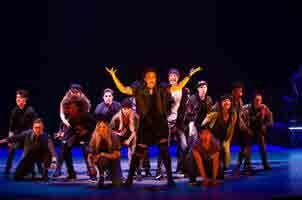 “Jagged Little Pill” debuted at the American Repertory Theater on May 5, 2018, and completed its run at the theater on July 15. The musical sold out 79 performances at the A.R.T.